Isn't there a skill to be found when doing your make-up, and doing it well? The minute we start wanting to 'correct' what we think should be changed about our natural features- the minute we stop doing our make-up 'well' . This post ISN'T for the highly trained make-up artists, who can pretty much work most make-up styles on anyone, or the make-up artists in the film/tv industry, who create a totally new 'character' out of an actor - even to the point where they are probably not even recognisable as themselves. These things are of course a mastery, and take a heck of amount of skill. This post IS for every other woman out there who uses make-up - it's important we know what works for us, and not give into too many make-up trends, or indeed, try to hide our natural features behind a heavy mask. Make-up is fun, and if used right, it can be a positive factor in embracing your natural self. Now, wait a minute, I know you're probably thinking how on earth can make-up lead to embracing our natural selves? I happen to have a very talented mother-in-law, who is not only highly skilled in make-up artistry, but is also passionate about women embracing who they are and being empowered in this. And during her make-up training, while also pursuing a career in counselling and going on a personal journey herself of acceptance, she realised there is something to be had in enhancing your natural features instead of using make-up as a mask. "I'm all about making the most of what you have rather than going for the latest look which seems to be big eyebrows at present! And very contoured cheek bones!" SO last saturday, over a jug of Pims (that we couldn't possibly finish all by ourselves! ;) ) made by her brilliant hubby - garnished with the best fruit and everything, I sought Pauline's help on my make-up. Recently i've been looking in the mirror and realising my make-up just wasn't cutting it anymore, I didn't look myself, and my eye make-up especially, was altering the shape of my natural eye which I didn't really like. For so long I have been a smokey eye girl, loving on the mascara and putting on as much eye make-up as possible without looking like a drag, even during the day - every day! And I probably still will fall into this habit, but I'm trying to kick it. This look is fine, if you take the time over it, and probably more suited for an evening look but I'm coming round to the idea that this look is probably more occasional than an everyday look. This week I haven't gone near my staple brown shadow, and have kept the mascara and eyeliner to the bare minimum. It's much less time consuming, and safe to say my make-up has sustained itself much better through the day, simply because there is less on my face to become messed up! But theres more to this than just that. I couldn't have avoided the habit without the help of Pauline. I learnt a lot from her about the fine line between enhancing your natural features and just simply ruining them or 'correcting' and 'hiding them' . The secret to not crossing this line is made up of various tips and make-up 'rules' that Pauline has generously given to me, to show you! it's real, no strings attached, advice, which I think every girl needs! SO I'll start by showing you the end result of my 'make-under' by Pauline plus some of the products used. There is much to be had in ditching the make-up trends and seeking out what works best for you. But for me, we realised greens, purples, mauves, and greys worked well. They made my eye's 'pop' instead of weighing them down. I used to swear by using browns, as a safe bet, but actually it's definitely not - brown shadow was only taking away from my eye colour, where as these other colours framed my eyes and made them pop. In other words, my shadow wasn't the focus, my shadow made my eyes the focus. Since last weekend, I have been using a purple/raspberry pink colour faintly on my eyes with a touch of black liner and smudged shadow under the bottom lash line, and I really enjoyed wearing this colour much more than the dark brown over-load. I felt my makeup complimented my natural colouring rather than taking away from it. As well as this, while attending two wedding's this weekend, my eye make lasted far better than any other time - picking the right colours for you make's all the difference. Almond, Round, Hooded? 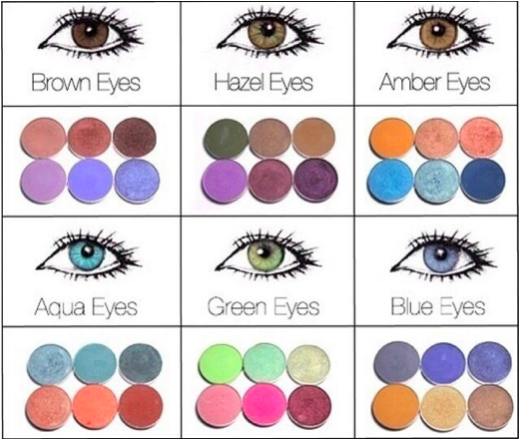 What eye-shape are you and what can you do with them? Do you have a crease in your eyelid? If not - simply you have what's called 'monolid' eyes. Is the crease in your eyelid visible? - If not then you have 'hooded' eyes. If your crease is visible and the bottom whites of your eyes are visible when looking straight ahead - you have 'round' eyes. And if your iris's disappear into the top and lower lids - you have 'almond' eyes. I know my eye-shape, now what do I do with them? Almond - "If you have this eye shape any make up will look great – especially the typical smokey eye. Much make up is tailored to the almond shape, but it is not possible on a deeper set eye and it’s all about enhancing the shape rather than correcting it. On a beautiful young eye it is possible to create the almond eye with the winged eyeliner but on a more mature eye this is not possible without botox! Using dark colours into the centre or inside of the eye will make a small eye smaller so the tip is to use lighter matt colours to open up the eye. Prominent eyes are better with darker shades." Round - "Round eyes look gorgeous rimmed with one shade instead of using lots of colours — the color appears balanced and not too over-the-top." Hooded - "Those with hooded eyes often complain about smudging. Whatever is on their lids tends to wind up on their browbones. So creating colours that look good smudged is the best way to go." How can I make my eyes 'pop'? As I mentioned above you now know the difference this has made for me - you can see that paying attention to the right colours pays off! "Warm colours – browns, bronzes, orange and peachy tones suit deeper skin toned with dark hair. Cool colours of greys, pinks, purples tend to suit blond hair, pale skin." "Blending is the most important skill when working with eye colours to create a softer natural look. Lighter colours with a darker shade on the crease or edge of the eye is better during the day whilst for an evening look darker colours can be used to create a more dramatic look." "It's all about that base, 'bout that base"
"A good foundation is a must to create the canvas – depending on your skin tone and type, this will tell you whether you need a lighter or deeper coverage"
and some that I came across just gave the most generalised answers! Anyone else get aggravated by this? But trust me, this article on Oprah is the bomb, Click here. I've got colour down for my eyes, but what about for my face? if you choose to use cool colours then cool pink tones for the cheek and lips"
"Contouring and highlighting should be used to enhance your natural look rather than change it." When I contour with powder bronzer, I keep to the old '3' technique by swiping your brush in a '3' motion, starting from one side of my forehead, swooping into the crevice' of my cheeks and then one swoop along my jaw line - and repeat on the other side. I then usually tap off all leftover powder on the brush and blend the bronzer into my skin even more, but I try not to spread it anywhere else other than the '3' shape. This is just my opinion, but I think if you apply bronzer outside of this 3 technique it begins to look false and can minimise definition of your facial structure. When highlighting I keep the top of my cheek bones and the ends of my brows, and maybe a little down the centre of my nose. I usually start with an illuminating liquid as a base to my foundation, for added lift - but again I'm not beauty blogger or an expert, so you need to know what works best for you! "Again anything is possible – it’s all about experimenting and there are no set rules – but remember it doesn’t take very much to enhance your own features and look. I was once told that the most attractive thing a girl can do is to smile so remember to do that..."